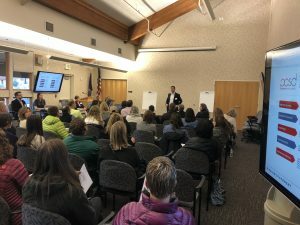 Park City School District successfully launched its education master planning process, The Future of Learning, this week by seeking feedback early in the process from the community. Those attending were asked what they believe the single most important outcome of the process should be. Some responses included an environment that support the whole child, incorporating critical thinking, creativity, collaboration, communications, cultural proficiency, and mastery-based proficiency, and having programs in place that will focus on careers in the world ahead. Tuesday, Oct. 30, the district held an all-day “The Future of Learning Summit” and invited 75 students, parents, teachers, principals, and business leaders to discuss the community’s vision for the education. “It was a rare opportunity to really discuss what our students will need in the future to be successful learners,” Superintendent Gildea said. Some of the major themes that evolved from the summit included: student-centered learning as a top priority, building relationships and trust, having meaningful engagements, providing positive, health and safe learning environments that are flexible and adaptable, and being committed to an inclusive community. The information gleaned from the summit will be shared with the Steering Committee at its next meeting on Nov. 6 in an effort to develop guiding principles for learning.